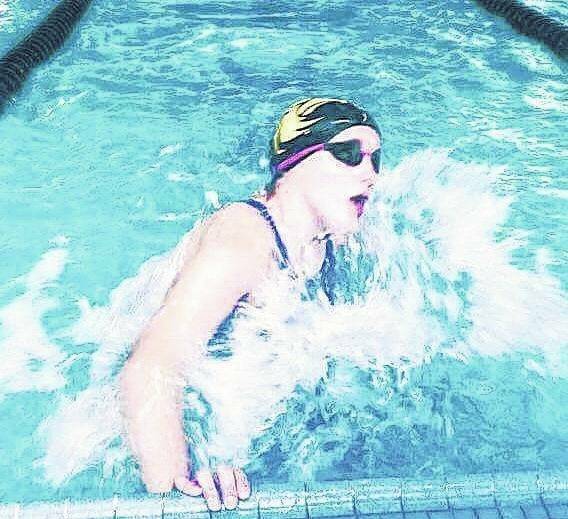 Submitted photo | Galion Inquirer Colonel Crawford swimmer Miranda Stone mid-turn during last Saturday’s TCAL Swimming Championships. Stone is a representative for Crawford competing in the girls 11-12 age group. NORTH ROBINSON — The Twin-County Area League (TCAL) swimming championships were at Colonel Crawford High School on July 8. It showcased a variety of swimmers of all ages from the six and under age group to the 15-18 year old age group. For the 28th consecutive year, the summer swimmers from Colonel Crawford captured the title, scoring 2862.5 points to far surpass the Mount Gilead Summer Swim Team (1196). Also in action at the championships were: 3. Upper Sandusky Swim Team- 998 points; 4. Bucyrus White Sharks- Summer- 878 points; 5. Tiffin Community YMCA- 594.5 and 6. Galion Community Y Dolphins- 188 points. Crawford took first in both the boys and girls eight and under 100-yard medley relay races. The girls team of Cami Roston, Allyssa Woodmansee, Ryleigh Foust and Sydney Link finished in 1:35.74 while the boys team of Wyatt Williams, Aidan Stone, Colten Montgomery and Trey Bruner won in a time of 1:30.42. In the girls 9-10 age group, Brynn Bruner, Ashtyn Rickel, Emma Montgomery and Gabby Roston broke a record that had stood since 1983 and won the 100-medley relay with a time of 1:07.14. The 11-12, 13-14 and 15-18 age groups swam the 200-yard medley relay in the championships. The 11-12 girls squad of Elli Mayer, Katie Hanft, Miranda Stone and Rylee Ritzhaupt from Crawford took home first in 2:12.47. Crawford’s boys team consisting of Gabe Thew, Branyan Rowland, Kevin Feik and Kaden Bruner won in the same age group with a time of 2:39.49. In the 13-14 girls bracket, the Eagles team of Cassidy Vogt, Emily Hanft, Kaisey Speck and Kassie Stine earned the title in 2:00.90. Pierce Krassow, Drew Krassow, Rylie White and Sari Conner snagged the win in the 15-18 group (2:07.11) and Weston Rose, Sam Rigdon, Clay Karnes and Nic Motter won for the boys (1:56.30). The freestyle relay events were formatted much the same way. The eight and under and the 9-10 year olds swam 100 yards and the 11 and up participants swam 200 yards. Crawford’s eight and under girls: Riley Finnan, Roston, Woodmansee and Foust won with a time of 1:24.32. Stone, Bruner, Williams and Montgomery took first on the boys side as well (1:17.32). Both the boys and girls squads in the 9-10 group won titles on the day. Rickel, Lucy Myers, Gabby Roston and Emma Montgomery broke the meet record from 2015, winning with a time of 58.49. Brady Fox, Andrew Heinle, Landon Sutter and Brady Rowe won with a time of 1:28.24. Both 11-12 teams won for Crawford as well. Elli Mayer, Miranda Stone, Rylee Ritzhaupt and Katie Hanft for the girls (1:53.61), establishing a new meet record and Kaden Bruner, Kevin Feik, Branyan Rowland and Thew for the boys (2:13.35). Kassie Stine, Kaisey Speck, Emily Hanft and Cassidy Vogt earned first in the girls 13-14 group (1:48.32) with a new meet record. In the 15-18 age group both the boys and girls teams representing Colonel Crawford swam their way to titles. Conner, Chloe Carman, P. Krassow and Rylie White on the girls side in 1:50.06 and Rose, Keton Pfeifer, Motter and Rigdon on the boys side (1:39.65). In the individual events on the day, Crawford swimmers earned 43 first-place finishes across all six age brackets. An * denotes a new meet record. Winners in the six and under group: C.Roston- 25-yard freestyle (19.83) and 25-yard backstroke (23.76); Hayden Young- 25-free (25.39) and 25-back (31.49). Winners in the eight and under group: Foust- 25-yard butterfly (18.15) and 50-yard freestyle (38.18); Woodmansee- 25-yard breaststroke (25.65); Montgomery- 100-IM (1:34.15), 25-yard fly (18.78) and 50-free (35.30); Bruner- 25-yard backstroke (21.54); Williams- 25-back (21.54) and 25-breast (24.92). Winners in the 9-10 age group: Rickel- 50-yard freestyle (29.97) and 25-fly (15.10) and 25-breast (17.52); Montgomery- 100-IM (1:15.72*) and 100-free (1:02.64*) and 25-back (15.53*); and Rowe- 25-breast (24.23). Winners in the 11-12 age group: Hanft- 100-IM (1:11.01), 50-free (26.84*) and 100-free (1:00.17); Ritzhaupt- 50-fly (32.57); Stone- 50-breast (33.11); Thew- 100-free (1:10.28); and Rowland- 50-breast (40.28). Nathan Barre, representing the Galion team, was an individual winner in the 100-IM (1:26.14). Winners in the 13-14 age group: Speck- 100-IM (1:08.25), 50-fly (29.69) and 50-breast (34.78); Vogt- 50-free (26.02*), 100-free (57.13*) and 50-back (30.51); and Kyle Taylor- 100-IM (1:08.31), 50-back (30.82) and 50-breast (33.71). Winners in the 15-18 age group: Kennedy Speck- 200-IM (2:39.61); P.Krassow- 100-free (59.73) and 200-free (2:11.94); White- 100-fly (1:05.01); Motter- 200-IM (2:25.06) and 200-free (2:00.54); and Rigdon- 100-free (54.53). https://www.galioninquirer.com/wp-content/uploads/sites/38/2017/07/web1_Miranda-Stone.jpgSubmitted photo | Galion Inquirer Colonel Crawford swimmer Miranda Stone mid-turn during last Saturday’s TCAL Swimming Championships. Stone is a representative for Crawford competing in the girls 11-12 age group.